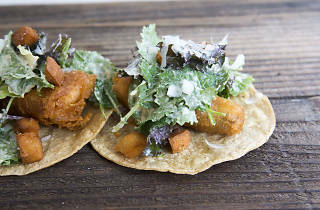 Nestled into a small lot in Downtown L.A. is Chicas Tacos, a pastel-splattered eatery serving tacos for the modern Angeleno—that is to say, with organic, non-GMO, wild caught ingredients. Inside, you'll make your way through a compact bodega offering homemade tortilla chips, salsas and t-shirts before ordering from the curated menu. 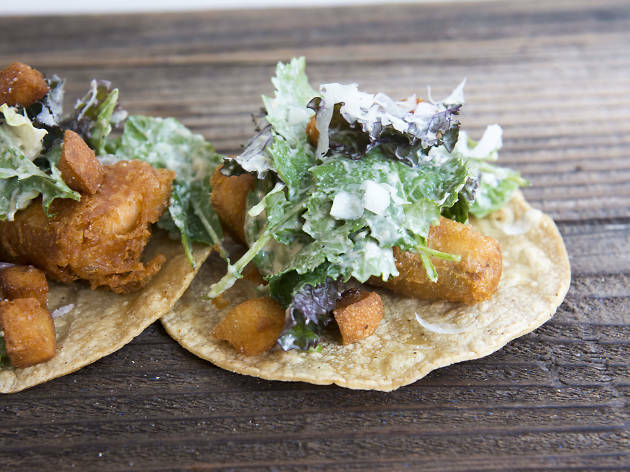 Beer-battered fish tacos come buried under Caesar salad, croutons and queso manchego, while the chicken taco is a lighter affair, topped with baja med salad, feta and cilantro. A cauliflower chorizo option is available for the vegetarians among us; whatever you decide to order, follow it up with a freshly made agua fresca—we're partial to the lavender cantaloupe, which you can sip on at one of Chicas outdoor picnic tables.